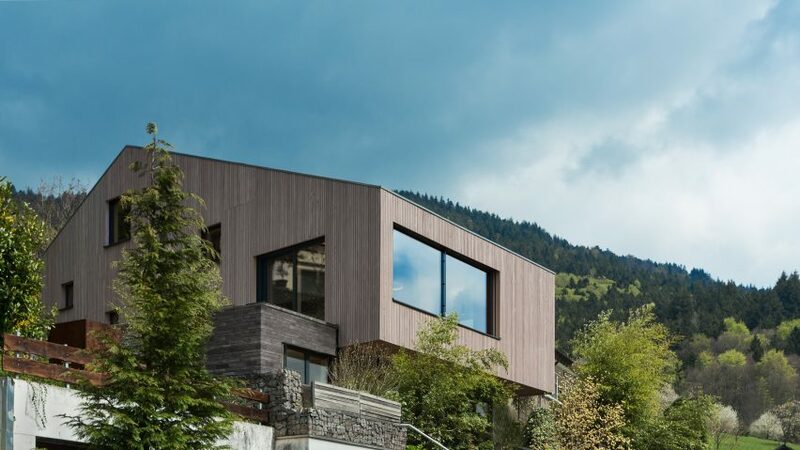 UberRaum Architects has added a stepped wooden extension to this mountainside house in Germany's Black Forest, offering its residents views of the surrounding trees and valley. London-based UberRaum Architects carried out the renovation and extension for a family who had outgrown its 1950s home in Germany's Black Forest – a forested mountain range bound by the Rhine Valley on its west and south side. The architects partly demolished the existing residence, leaving just the ground floor concrete plinth, and added a timber extension on top. The double-height addition steps up the sloped site to offer a variety of views at different levels, while a pair of outdoor terraces project towards the valley. Clad in locally sourced silver fir, the upper level peaks above its woodland surrounding, while the original concrete structure is covered in slate and nestles into the mountainside. Sitting at an altitude of 800 metres above sea level, it is called Cloud Cuckoo House because when the valley is foggy it looks like it is floating on clouds. "Cloud Cuckoo House grows out of its steeply sloping mountainside location, with rooms and spaces cascading down the hill, creating a living landscape of terraces on different levels, all under one roof," explained the architects. "When fog drifts into the valley, the home for a young family appears to float above the clouds, enjoying magical uninterrupted views across the fairytale landscape of the Upper-Rhine area," they added. Inside, the gabled roof is also lined with silver fir from the Black Forest and forms a canopy for a series of living areas, from wide platforms to more intimate niches. Windows framed with light wood are arranged at different heights, to offer views from the various levels. "The interior is lined with picture-frame windows of varying sizes," said the architects. 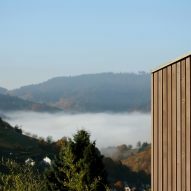 "Each one gives a different view of the landscape, from a 50-kilometre view towards the Rhine Valley, to a five-metre close-up of a pine tree in the back garden." "Together the windows create an indoor exhibition of the Black Forest; embedding the house Cloud Cuckoo in its setting, and shaping its character," they added. The open-plan kitchen and dining room features an eight-metre-long window with a set of wooden steps at the back of this space that form auditorium-style seating. The staircases lead up to the lounge and study area on the mezzanine floor level. The architects cut a large void through the existing floor plinth so that they could insert an oak staircase to connect the main living space with the bedrooms that occupy the existing lower level. Lights on long red pendants hang through the gap – one of a series of red accents that the house features. Other than this the interiors are finished simply with white-painted walls and wooden flooring. LED lights are laid flush with the ceiling. The extension was prefabricated to enable fast construction time, allowing the building to quickly be made weathertight before the cold Black Forest winter. 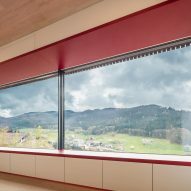 The house is finished to German Passivhaus standard, and includes a highly efficient, well-insulated building fabric that results in ultra-low energy consumption for heating and cooling the building. Other homes near the Rhine valley include a concrete house with a swimming pool by Marte.Marte Architects and a 37-metre-long residence and studio by Juri Troy Architects.